Q When do I get my results? A HPAT - Ireland results will be available to UL applicants and mature candidates at the end of April 2019. Results for all other candidates will be released in late June 2019. Results are released online and you will receive an email explaining how to access your results. Q What if I can’t remember my candidate ID? A Don’t worry. Your Candidate ID will be provided to you when you receive the results notification by email. However, you will need to remember the email address you used to register for HPAT-Ireland. Q Do I provide my scores to the universities? A No, your results will be provided to the CAO and the University of Limerick by ACER. Q Does the HPAT – Ireland Office need my CAO number? A Yes. 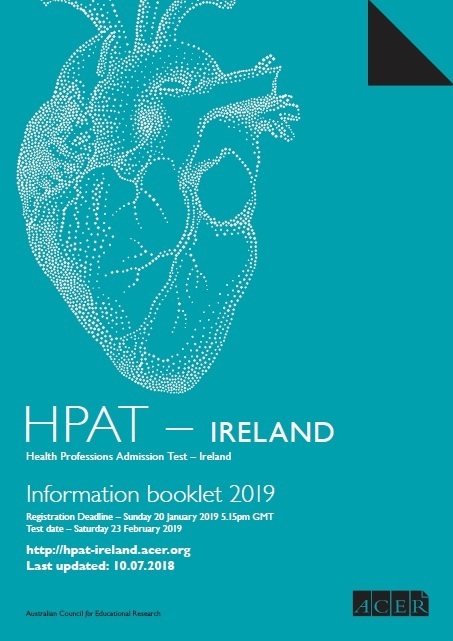 If you are applying for an undergraduate medicine course for the 2019 admission cycle, then the HPAT – Ireland Office will need your CAO number. You will be required to enter it as part of your online registration. Q Can I have my test marked again? A ACER will not enter into appeals against HPAT – Ireland results. Candidates are advised that HPAT – Ireland results are released only after careful calculation and extensive checking. However, following receipt of the HPAT – Ireland Statement of Results, a candidate may apply for a re-check of his or her answer sheet, if they believe an error may have been made. A re-check involves individual rescoring of the answer sheet. The resulting Scores will then be compared with the original Scores to check that there has been no error in calculating or collating marks. Requests for re-checks for UL applicants and mature candidates must be submitted online within one week from the release of results in late April. Requests for re-checks for other candidates must be submitted online by midnight BST on 5 July 2019. Late requests will not be considered. A fee of €85 is payable for this service and payment is by credit card only. In the unlikely case of a scoring error being found, the re-check fee will be refunded, and the candidate, the CAO and the universities using HPAT – Ireland will be notified. All re-checks will be processed after the deadline and candidates will be notified of the outcome shortly after. It is not possible to give special consideration for impaired performance on the day of the test caused by unexpected or minor illness or misadventure. Q Is my Overall Score wrong? A The Overall Score is calculated as a weighted aggregate of the three section Scores to several decimal places and then rounded. As the three section Scores are reported as rounded numbers on your Statement of Results it is not possible for you to replicate the process and calculate your Overall Score. For example, if your Section Scores are 50, 50 and 50, your Overall Score could be 149, 150 or 151 depending on your Section Scores, before rounding. If your Section Score 1 is 49.5, your Section 2 Score 49.6 and your Section 3 Score 49.7, your Overall Score before rounding is 148.7 and the Overall Score that appears on your Statement of Results is 149. If your Section Score 1 is 50.1, your Section 2 Score 49.8 and your Section 3 Score 50.4, your Overall Score before rounding is 150.1 and the Overall Score that appears on your Statement of Results is 150. If your Section Score 1 is 50.4, your Section 2 Score 50.3 and your Section 3 Score 50.1, your Overall Score before rounding is 150.9 and the Overall Score that appears on your Statement of Results is 151. Q What is the Written English Score and do I need one? A The Written English Score is provided ONLY if you applied to the MSc Occupational Therapy (Professional Qualification) or the MSc Speech and Language Therapy (Professional Qualification) at the University of Limerick AND have completed the additional 1 hour Written English Component. Q What is the maximum possible Written English Score? A The maximum possible Written English Score is 100. Q Is the Written English Score included in the Overall Score? A No. The Written English Score is a separate score and is not used to calculate the Overall Score.